June 17, 2014 at 12:15a.m. 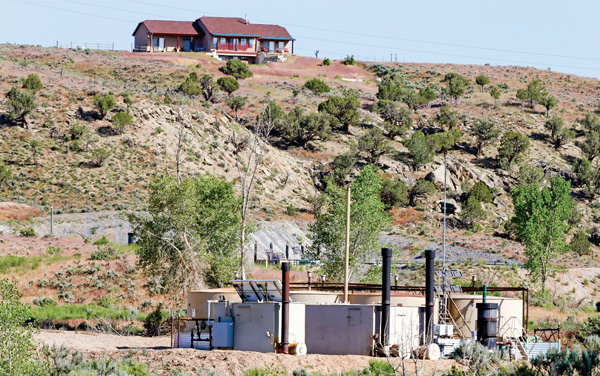 In this June 9 photo, an oil-and-gas well pad and storage tanks sit below a home in a sparsely populated area near New Castle, Colo., a small farming and ranching settlement on the Western Slope of the Rockies. Four in 10 new oil and gas wells near national forests and fragile watersheds or otherwise identified as higher pollution risks escape federal inspection, according to an Associated Press review that shows wide state-by-state disparities in safety checks. Four in 10 new oil and gas wells near national forests and fragile watersheds or otherwise identified as higher pollution risks escape federal inspection, unchecked by an agency struggling to keep pace with America’s drilling boom, according to an Associated Press review that shows wide state-by-state disparities in safety checks. Government data obtained by the AP point to the Bureau of Land Management as so overwhelmed by a boom in a new drilling technique known as hydraulic fracturing, or fracking, that it has been unable to keep up with inspections of some of the highest-priority wells. That’s an agency designation based on a greater need to protect against possible water contamination and other environmental and safety issues. Sen. Edward Markey, D-Mass., a member of the Senate Environment and Public Works Committee, on Monday said he will press Interior Secretary Sally Jewell to explain what the department will do to increase well inspections in light of the AP report. “No one would have predicted the incredible boom of drilling on federal lands and the number of wells we’ve been asked to process,” she said. Since fracking reached a height in 2009, about 90 percent of new wells on federal land are drilled by the process, which involves pumping huge volumes of water, sand and chemicals underground. May 11, 2014 5:28 p.m.